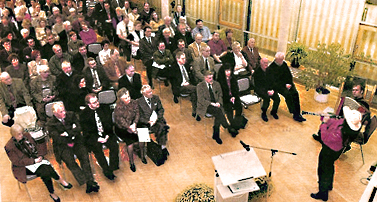 Max Liebster becomes an honorary citizen in his hometown. Excerpts from an article printed in the November 20, 2004 issue of the daily Bergstrasser Anzeiger. 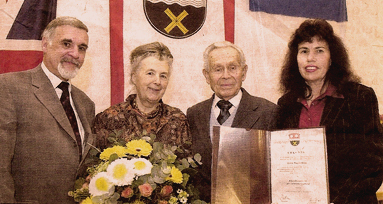 The new honorary citizen from Lautertal, Max Liebster (third from the left) with, from left to right, Mayor Jürgen Kaltwasser, Max's wife, Simone Arnold-Liebster and Community of Communes Chairwoman, Heidi Adam. Max Liebster’s official words of thanks were a plea for hope and charity that lie in the deep faith of the 89-year-old man. Contact with members of Jehovah’s Witnesses who wore the “purple triangle” in concentration camps has permanently influenced Max Liebster’s life and philosophy. His biography, Crucible of Terror, and his wife’s memoirs, Facing the Lion, help to close the gaps and to come to terms with the Holocaust. Klages emphasized how the honoring included the activities of the foundation as well as the furtherance of Lautertal’s good reputation throughout the world by means of Liebster’s international engagements. 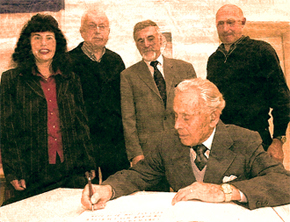 Following the festivities, Max Liebster signed the community's Golden Book.